1. In late 2013, Hezbollah had intensified its military involvement in the civil war in Syria, suffering heavy losses. The main three sites of Hezbollah fighting were the eastern rural area of Damascus (Al-Ghouta al-Sharqiyya), the Al-Qalamoun mountain range, north of Damascus, which runs along the Syrian-Lebanese border (the Homs – Damascus route), and the grave of Al-Set Zaynab, south of Damascus. 2. 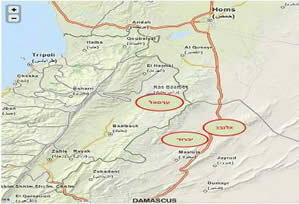 In these three sites, Hezbollah operates as an auxiliary force, aiding the Syrian army and the Syrian security forces, and not as a military unit with independent missions (as was the case in the Al-Qusayr campaign).This fighting was closely coordinated with the Syrian army:according to Kuwaiti newspaper Al-Rai (December 12, 2013), the Syrian army and Hezbollah maintain a joint operations room for managing the campaign. We estimate the number of Hezbollah operatives in the fighting at several thousand, an estimate similar to the scope of the Hezbollah force in the Al-Qusayr campaign (May 19 – June 5, 2013). 4. Beyond the fundamental interest of Iran and Hezbollah to help promote the strategic goals of the Syrian regime, Hezbollah has two interests of its own, security and sectarian-religious.From a security aspect, Hezbollah seeks to gain control over the area bordering on the Syrian-Lebanese border (the Al-Qalamoun mountain range), out of which organizations affiliated with Al-Qaeda and the global jihad launch terrorist attacks against Hezbollah in Lebanon.From a sectarian-religious aspect, Hezbollah is committed to continue defending the grave of Al-Set Zaynab, which is under constant attack by the rebels, who are aware of the site’s religious significance (Hezbollah suffered a large part of its losses in the compound of the grave). 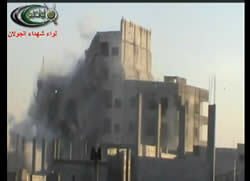 YouTube video of a military framework so-called the Golan Heights Martyrs Division, documenting an explosion at Hezbollah’s headquarters near the grave of Al-Set Zaynab (Farah News Online, October 28, 2013). In an interview with the Lebanese channel OTV (December 3, 2013), Hassan Nasrallah admitted that the building collapsed but claimed that no one was inside. 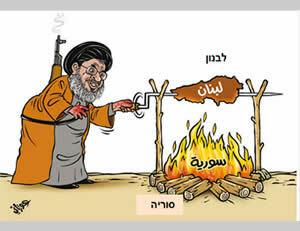 Therefore, Nasrallah said that the allegation that Hezbollah suffered 25 casualties in the building is incorrect. 5. A Hezbollah “military source” explained to a reporter from the Lebanese newspaper Al-Joumhouria why the Al-Qalamoun mountain range is significant for both the Syrian regime and Hezbollah.He said that for the Syrian regime, the Al-Qalamoun mountains are the only route to the north, and capturing them will enable it to reach the city of Homs and from there the cities of Tartous, Latakia, Banias and Hama.He added that for Hezbollah, the Al-Qalamoun mountains are of great importance from a security standpoint, seeing as the organization has reliable information that all of the car bombs are brought to Lebanon from the Al-Qalamoun mountains via the town of Arsal (in the north of the Beqaa Valley).The same “military source” mentioned the town of Yabrud, which is held by rebel forces, as the place from which car bombs are sent to Lebanon.He also noted that most of the rockets fired at towns in the Beqaa Valley that are affiliated with Hezbollah are fired from the Al-Qalamoun Mountains (Al-Joumhouria, December 16, 2013). A reporter from the Lebanese TV channel Al-Mayadeen, which is affiliated with Hezbollah, explains the importance of the campaign currently raging in the town of Yabrud. According to her, the route between Yabrud (Syria) and Arsal (Lebanon) is an important route for smuggling weapons and infiltrating into Syria. There is also a dominant presence of operatives from both the Al-Nusra Front and the Islamic State in Iraq and al-Sham in the town. She claimed that the car bombs that exploded recently in Lebanon were assembled in a workshop in Yabrud (the Lebanese TV channel Al-Mayadeen, December 11, 2013). 6. 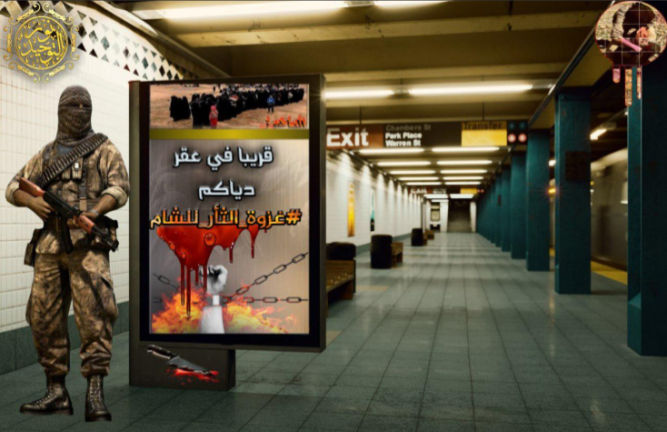 During the last campaign (which has not yet ended), which included large Hezbollah forces, the organization suffered heavy losses:in November and the first half of December 2013, 47 Hezbollah operatives were killed.Thus the total number of casualties, which amounted to around 180 at the end of the Al-Qusayr campaign (early June 2013), now amounts to around 300. Note: To date, we have counted the names of 272 dead.However, this is the minimum and we must take into account that not all the names of those killed were publicized, not all of them were sent for burial in Lebanon and not all of them are known to us.Accordingly, in our estimation, their number may be higher and total around 300 (see Appendix A for details of the fatalities). 7. 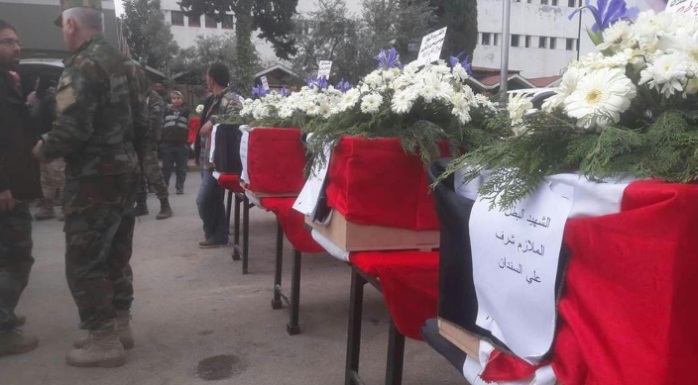 The 47 operatives who were killed in November and the first half of December 2013 fought in three combat zones:the rural eastern area of Damascus (13 dead); the battles in Al-Qalamoun (5 dead), the battles in the area of the grave of Al-Set Zaynab (24 dead).As in the past, most of the fatalities (20) are from southern Lebanon and the rest (11) are from the Beqaa Valley, Beirut (1), and from Syrian territory (1).We believe Hezbollah may exaggerate the number of operatives killed at the grave of Al-Set Zaynab and, on the other hand, may understate the number of fatalities in the rural eastern area of Damascus and in Al-Qalamoun, with the aim of legitimizing their deaths from a religious standpoint in the eyes of the Lebanese Shiite community. a. Ali Iskandar (Ali al-Akbar)– senior Hezbollah commander from Al-Bazourieh in southern Lebanon.He served as an operations officer and commander of Hezbollah forces in the rural eastern area of Damascus.He was killed on November 23, 2013, in the fighting in the rural eastern area of Damascus. b. Ali Hossein al-Bazi (Hajj Sajed)– Hezbollah commander.He was a native of the village of Bint Jbeil, in southern Lebanon, but lived in Harat al-Saida (Sidon).He was formerly in charge of Hezbollah in Harat al-Saida.His job was training Hezbollah operatives.He was killed in battle in Al-Qalamoun on December 8, 2013. 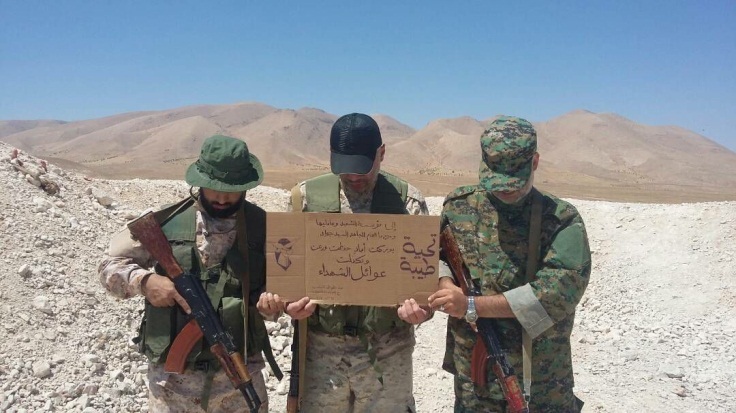 Left: Ali Hossein al-Bazi (Hajj Sajed), killed in battle in Al-Qalamoun (Panorama Middle East website, December 8, 2013); Right: Ali Iskandar (Ali al-Akbar), killed in battle in the rural eastern area of Damascus (Bint Jbeil website, November 23, 2013). 9. 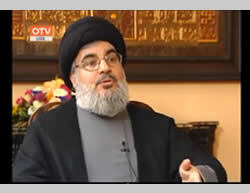 In an interview granted to the Lebanese channel OTV (December 3, 2013), Hassan Nasrallah admitted that his organization was forced to expand its involvement in the fighting in Al-Ghouta al-Sharqiyya and Al-Ghouta al-Gharbiyya (the rural areas east and west of Damascus).He also noted that the organization works against the “armed groups” in the Al-Qalamoun region along the Syrian-Lebanese border.As a direct result, Nasrallah admitted, Hezbollah had suffered a large number of fatalities. However, he denied Lebanese media reports stating that Hezbollah’s losses amounted between several hundred and 1,000 (Note:In our assessment, this estimate reflects the number of Hezbollah fatalities since the beginning of its involvement in Syria). 10. Nasrallah rejected the claim that Hezbollah’s involvement in Syria began following an Iranian decision.He stressed that Hezbollah’s involvement in Syria was gradual, and that “It was our decision” and the Iranians were informed of the decision. (Note:In fact, Hezbollah’s involvement in Syria is part of Iran’s overall strategy of preferring indirect involvement through proxies rather than direct involvement. )Nasrallah noted that the top priority is Damascus, Homs and the area along the Syrian-Lebanese border.On the other hand, he said that there is no Hezbollah presence in the Daraa and Quneitra governorates, and in governorates in northern and eastern Syria (Deir al-Zor, Al- Raqqa, Al-Hasakah). a. The grave of Al-Set Zaynab (south of Damascus): Nasrallah noted that while most of the rural sections of Damascus have fallen in the hands of the rebels, the compound of the grave of Al-Set Zaynab remained isolated.He said that the “armed groups” (in this case, the term “armed groups” is used for jihadis) are striving to destroy the shrine and that this could have led to an inter-communal war.He said that Hezbollah’s involvement during the civil war in Syria began with dispatching 40-50 operatives to the area of ​​the shrine in order to assist the Syrian army and residents of the area in defending it. “This is how our story in Syria began” (Nasrallah does not specify how many of the organization’s operatives are currently protecting the shrine, suffering heavy losses). 13. 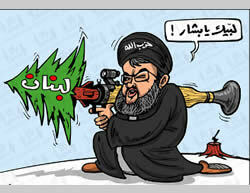 Strong criticism of Hezbollah’s involvement in the fighting in Syria continues in the Lebanese media and the Lebanese scene.This criticism, on the part of Hezbollah’s opponents, was expressed in various editorials, cartoons against Hezbollah’s participation in the fighting in Syria, and remarks made by Lebanese officials who belong to the anti-Hezbollah camp. For example, former Lebanese Prime Minister Saad Hariri claimed that Hezbollah leader Hassan Nasrallah is involving Lebanon in the Syrian crematorium and added that it’s a pity for Lebanese blood to be spilled this way. These remarks were made in response to an interview with Hassan Nasrallah, in which he said that “he himself is prepared to go fight in Syria” (Sky News in Arabic, October 18, 2013).Former Lebanese Prime Minister Fouad Siniora claimed that Hezbollah is killing the youth of Lebanon and Syria, and that its media is misleading the Lebanese public (Al-Hayat, published in London, September 14, 2013). 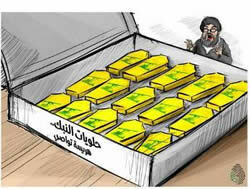 The Lebanese newspaper Al-Mustaqbal (December 11, 2013) claimed that 292 Hezbollah operatives had been killed in Syria. This number corresponds with our own estimate. On the other hand, the All4Syria website (December 11, 2013) claimed that Hezbollah had lost about 1000 of its operatives in Syria. The same website published 450 names and pictures of Hezbollah operatives allegedly killed in Syria. The website said that it would publish more names and pictures. We estimate that this figure is exaggerated. The names and the pictures are now under our examination. 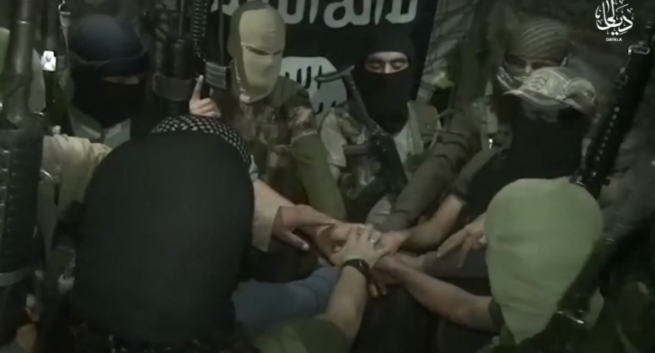 The All4Syria website claimed that Hezbollah had suffered 1,000 fatalities. 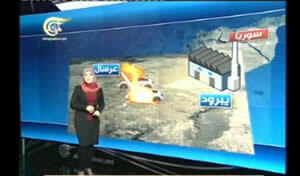 Al-Jazeera TV also mentioned this figure, which is extremely exaggerated, according to our estimation. Hezbollah operative Qassem Qasir denied reports that the number of Hezbollah fatalities had reached around 1,000.He noted that Hezbollah had never published the number of fatalities, not even in the Second Lebanon War (Al-Jazeera TV, December 15, 2013).